Pauper EDH allows only commons, with the exception of the commander, so no tutors, unfortunately. 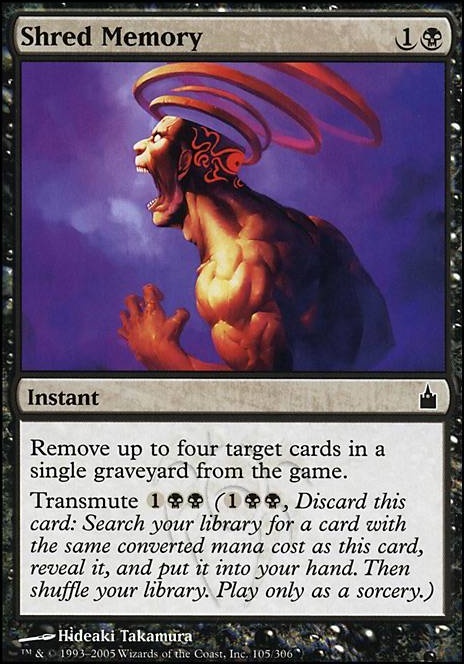 In Pauper, we tend to use Transmute for this reason, which in a mono-black deck means Shred Memory , Dimir House Guard or Brainspoil . Not much for 2 mana that I would want, so Shred Memory is only really good in a meta that includes decks that somehow utilize the graveyard, but the other two might get me something useful and aren't too bad on their own, so I might consider them. Maybeboard for the time being. Hey buddy! Decent start so far. I never liked how expensive the cost for gorgons was though lol Below are a few ideas that came to mind that might help with Hapatra and your death theme. The one thing that really sticks out to me is Shred Memory . The ability can be good, but when it's not good it's really bad, as the sorcery speed transmute will slow you down for many of your premium 2-drops. After your comments on my Tasigur, thought I'd drop by and check your other decks. I too run Lazav combo though at a much lower cmc. Curious as to why not run Careful Study or alternative tutors Dimir Machinations , Shred Memory , or Dizzy Spell to pull combo pieces. 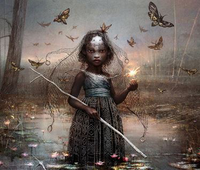 You could use more Faeries. Typically, you want to go for a minimum of 30 tribe members in a tribal EDH deck. You might also want Muddle the Mixture , Dimir Infiltrator , and Shred Memory to grab your Oona's Blackguard and Bitterblossom , seeing as the deck really ticks with those two cards in play. Along those lines, Notorious Throng and Knowledge Exploitation are also good. You also need more early-game ramp. Talisman of Dominance and Dimir Signet seem like givens. As for what to cut, Cryptic Gateway doesn't make a whole lot of sense. It's a 5 mana artifact that lets you tap two creatures to play a card with a maximum CMC of 4. 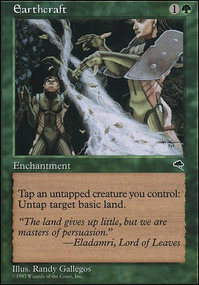 Likewise, I love Rite of Replication as a card, but what are you copying that's worth the mana? Followed Footsteps seems awfully mediocre, and Tree of Perdition doesn't seem to go great with a deck that's going to be slowly draining the opponents over a number of turns. You also seem to be pretty heavy on creature removal. Do you really need Cast Down, Doom Blade, Murder, Go For the Throat, Tragic Slip, and Imprisoned in the Moon with three Wraths and Control Magic? I really like your deck!!! Maybe try some Peat Bog Rite of Consumption Shred Memory ? Ok, I'm off work now. Let's talk draw options. 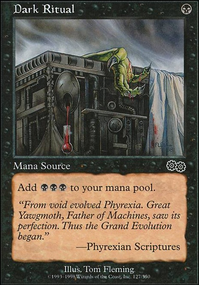 It appears you have some decent draw engines, I would mention Tymna the Weaver and Grim Haruspex as more options if needed. 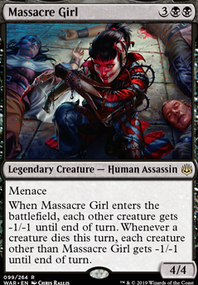 Tymna because you can potentially draw 2-4 cards easily with her and Haruspex as a better Midnight Reaper same stats/cost and none of the lifeloss. 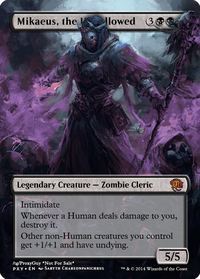 Your missing Vampiric Tutor , if within your budget I would strongly consider it for a future upgrade, also don't overlook Shred Memory and Dimir Machinations to get some of those combo pieces. I personally like Open the Armory and Steelshaper's Gift as well to give better odds of hitting Skullclamp and Nim Death-Mantle while not having to waste more versatile tutors on them. You appear to only be running two sinks in Twilight Drover and Death Grasp. 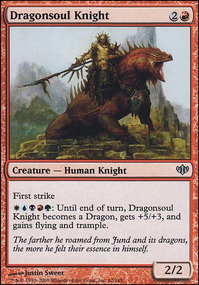 I would suggest cutting some big mana producers or add cards like Exsanguinate , Torment of Hailfire , or Walking Ballista over both your current sinks as Death Grasp is single target and Drover is slow outside of combo. Also Torment and Exsanguate can be tutored by Shred Memory. Win-Con's....the Blood/Bond combo seems alright but at 10 cmc I'm not a fan as I feel they are not strong enough pieces on their own and harder to tutor for. I opted for Teysa, Orzhov Scion and Darkest Hour as the primary loop as it is well established and that low cmc package allows you to drop it and win pretty quickly with little set-up vs trying to land both Blood/Bond plus lifegain to win. I'd say that's a meta call for you. The Titan loop is great I would however strongly consider Altar of Dementia as another sac outlet and Altar of the Brood as another finisher once a loop is established. Also Karmic Guide and Reveillark just outvalue Blood/Bond in that the can recur pieces outside of combo as well as combo themselves. Athreos, God of Passage is just insane value as with Teysa out it reads gimmie back my dude or take 6.
gravepact why have only 1 Dicate of Erebos when you can have 2. Sifter of Skulls both ramp and token generation. Chose this over Pitiless Plunderer due to the tokens. Nether Traitor like Reassembling Skeleton. Afterlife Mechanic in general..get double them tokens, also great for Deathmanle shenanigans, or really anything that dies to create a token. Cuts.......always the hard part, everything over or at 5cmc needs to be questioned. Demon of Dark Schemes is super lackluster and slow, Kokoshu paints a big target, Black Market is slow, Debtor's Knell is too mana intensive, Solemn Simulacrum is a bad fit at 4cmc. Revel in Riches is a worse win condition I feel than Approach of the Second Sun in this deck. With this wall of text I will stop and let you reflect, can chat more once you take a look.